Entrance Test 2019 is 30-04-2019. Candidates who are completed degree in the pattern of 10+2+3 or in 12+3 or in 11+1+3. Written exam for this KRUCET 2019 will be conducted from 13-05-2019 to 16-05-2019. 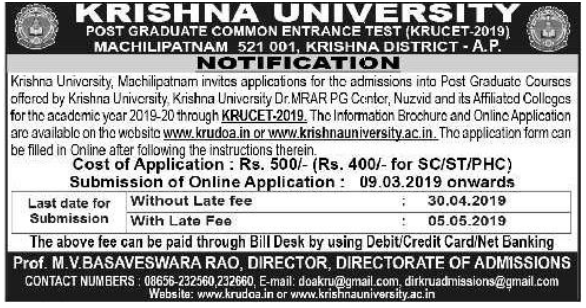 KRUCET 2019 Hall Tickets, Exam pattern, KRUCET Counseling dates and other related information about this Krishna University Post Graduate Common Entrance Test 2019 is updated below. 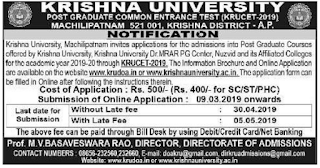 Bachelors degree qualified candidates are eligible to apply for this Krishna University Common Entrance Test. At the time counseling candidates have to pay the counseling fee and other fee if any. Fee reimbursement is applicable for KRUCET PG Courses. KRUCET 2019 Hall Tickets will be available 10 days before the exam date. Candidates who are looking for post graduation course they can apply online for KRUCET 2019 on or before 30-04-2019. Pay the application fee online and submit the application fee at www.krudoa.in.